Today was quite the day, we are quickly moving back into full throttle Holly mode. The day started with baby Grace at 6:00 a.m., once I had her settled I packed lunches and I prepared for my first client of the day who was coming at 8:30 a.m. 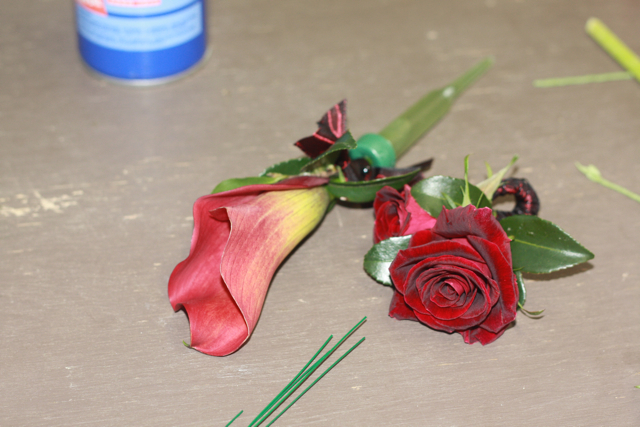 I had a floral design student arrive at 10:00am and then we went into designing. My first piece of the day was Lynda's bridal bouquet. I knew Lynda when she was 7 years old. I used to date her brother and I spent a lot of time in their home when I was young. Her family was absolutely the reason why I wanted a big family. In fact Lynda was the 7th child of the family and I have 7 kids as well. Her family seriously had a big impression on me. I adored this young lady and I recently reconnected with her in SFO. She literally saw that I was in CA. through Facebook and we agreed to meet. It had been at least 27 years since I had seen her but we had a blast meeting as adults. I promised her that when she married I would do her bridal bouquet. Being true to my word I FedExed my first bridal bouquet to CA. Yep California, lets all hope, wish, and pray that the bouquet makes it safely to the little girl I knew and loved. 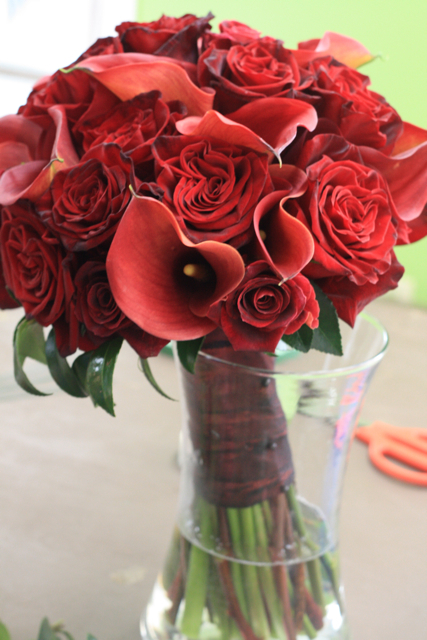 I created Lynda's bouquet of wine toned callas, black magic roses, and black beauty roses. The bouquet was placed in a paper mache bucket. 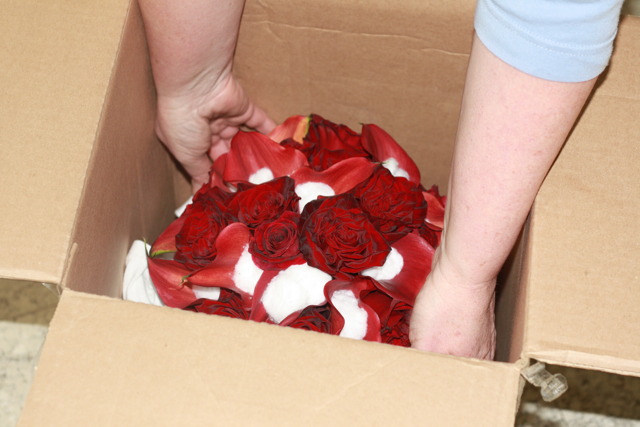 We stuffed cotton into the center of the callas to protect the lily, we wrapped the bouquet in cotton t-shirts and stuffed the bouquet into a box. We actually stuck the bucket to the bottom of the box with putty, hoping it would make it more secure. 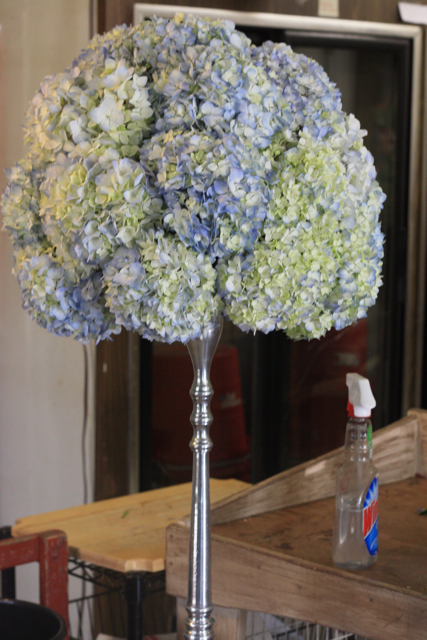 We wrapped cotton and paper all around the bouquet to keep it tight and snug. We also placed a grooms boutonniere in the box. Making this bouquet was such a pleasure and I am hoping this story has a happy ending. I am sure I will twitter the results tomorrow. I am so excited for Lynda and I am so glad I got to be a part of her wedding. 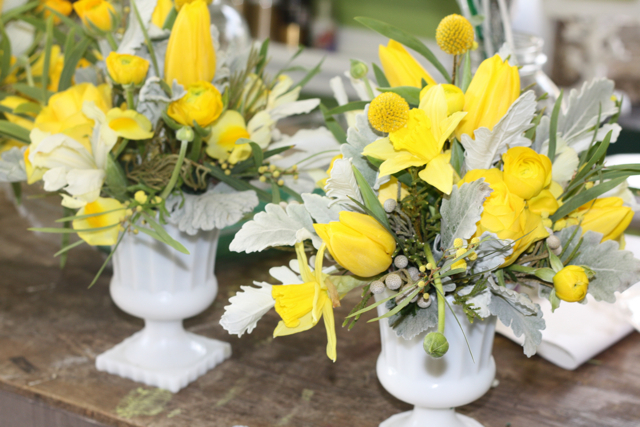 These lovely designs of yellow and gray were created for our friend Jamie of Simply Chic Events. Next we started designing for tomorrows wedding. During this time my student just watched the comings and goings of a day at Holly Chapple. I designed a bouquet of gray feathers, white roses, sahara roses, blue hydrangea, silver brunia, and dusty miller for tomorrows bride. 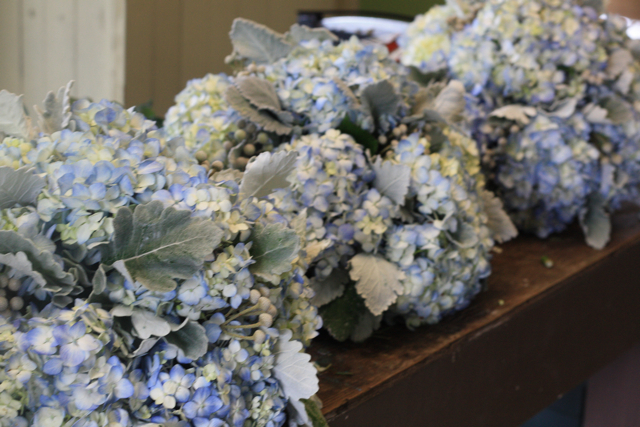 Huge balls of blue hydrangea were created for my silver stands. Here are the pieces hanging "in the cooler". We also had a visit from my man Don. Don is doing an exhibit tomorrow and we created a centerpiece for his table using foliage's and branches from his property. Seeing Don was such a happy thought. We LOVE Don and I am ready to see him at my door every week. He is my favorite neighbor! Yep I will say it again we LOVE Don!!!! We also had a visit today from photographer Genevieve Leiper and my past bride Kristin ( a story about her is coming soon.) The house was hopping all day long. Throughout the day I was able to answer questions and share knowledge with my student. We did a final consult at 5:00pm and sometime after 6:00pm my student left. When I had a few minutes to reflect on the day I was blown away by all that had happened. My last big project of the day was ordering flowers for my sisters wedding. Next week I will be designing in TX. Being the nontraditional bride my sister just sent me pictures of the dresses and the colors of the wedding today ( I could kill her). Yep this one will be the challenge of a lifetime. She keeps saying "its no big deal, you can do this, it's only 25 tables." I can already hear the fighting and the screaming. Where are my scissors? Vases you needed vases? Tags: blue hydrangea, sahara roses, white roses, black magic rose, don's dahlias, holly chapple, genevieve leiper. Holly, you are amazing! I am so excited to see the bouquet and boutineers tomorrow. I can’t thank you enough. I’ll send you a photo tomorrow to show you how it arrives. Wow…and you still have time to blog?! I’m dying to see how that gorgeous bouquet makes the trip to CA…that was a brave undertaking. Love the yellow designs and the huge hydrangea arrangement. I’m amazed at what you can do in a single day…those students are so lucky to shadow you. Hope you got a good night’s sleep!